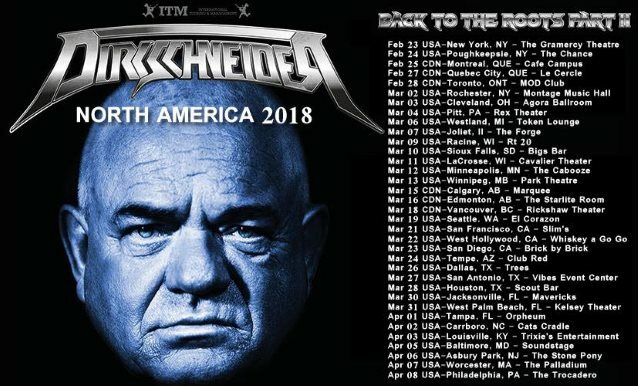 DIRKSCHNEIDER — the band fronted by former ACCEPT singer Udo Dirkschneider — will return to North America in early 2018. Dirkschneider spent the last year and a half touring under the DIRKSCHNEIDER banner, performing classic ACCEPT songs for the last time. The trek, which was originally supposed to conclude with the band's North American run in January/February, has now been extended through early 2018. In a message on the DIRKSCHNEIDER Facebook page, Udo explained his decision to continue touring as DIRKSCHNEIDER, saying: "Originally it was our plan to go back to touring with [Dirkschneider's long-running band] U.D.O. in 2017. But we have received an incredible number of emails and letters from fans begging us to continue with DIRKSCHNEIDER, and as there are still so many (ACCEPT) songs left to be sung, we have decided to bow to your demands! "We are thrilled by the idea of continuing and we are really looking forward to seeing you all again live on tour! "Oh, we nearly forgot to tell you about possibly the most important point of all: From October 2017 on, DIRKSCHNEIDER will tour with an almost completely NEW setlist. Of course, it will still contain only ACCEPT hits, but this time with many different songs compared to the last tours." Udo told Canadian rock journalist Mitch Lafon that his decision to perform classic songs from ACCEPT for the last time under the DIRKSCHNEIDER banner was the result of his desire to focus on the U.D.O. material on future tours. He explained: "A lot of people ask me, 'Why do you do this?' And I said… Always people are asking, 'Oh, can you play this ACCEPT song and this ACCEPT song and this ACCEPT song?' I mean, I have fifteen U.D.O. albums out, and, for me now, U.D.O. is U.D.O. Of course, I know that the people like to hear ACCEPT songs with my voice, but I wanna close something — I wanna close, like a book, and say, 'Okay, that's it. I read it.' Sometimes you have to come to an end with something. I wanna close up everything with ACCEPT. And this will be the last time. And I said, okay, I'll do one more tour. It will be a world tour. And yeah, that will be the last time that you… When we are on tour with U.D.O., we'll never play any ACCEPT songs again." DIRKSCHNEIDER released a live album called "Live - Back To The Roots" on October 28, 2016 via AFM Records. The effort, which was recorded on April 2, 2016 at Kaminwerk in Memmingen, Germany, was made available as two-CD digipak and gatefold three-vinyl in four different colors (black, gold, silver and clear). 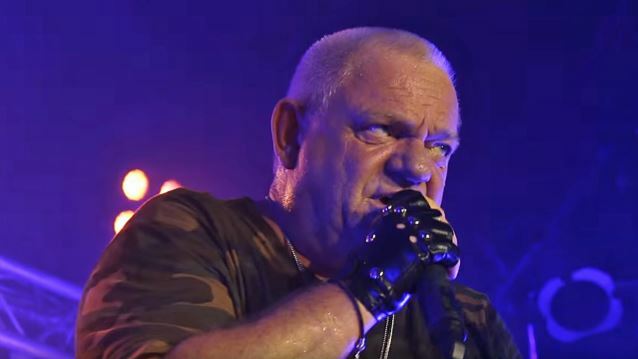 In addition to Udo, the DIRKSCHNEIDER band on the recent tours included his son Sven Dirkschneider on drums, Fitty Wienhold on bass, Andrey Smirnov on guitar and Kasperi Heikkinen on guitar. Kasperi has since left the group and was replaced by Bill Hudson.